৪র্থ-ডিগ্রি সমগ্র ত্বক দ্বারা প্রসারিত ও অন্তর্নিহিত চর্বি, পেশী এবং হাড় কালো; মামড়ি সঙ্গে দগ্ধ শুষ্ক যন্ত্রণাহীন পরিবর্জন প্রয়োজন Amputation, significant functional impairment, and, in some cases, death. 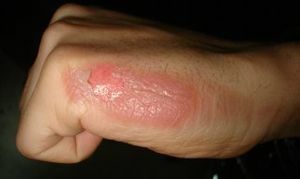 Burn severity is determined through, among other things, the size of the skin affected. The image shows the makeup of different body parts, to help assess burn size. The size of a burn is measured as a percentage of total body surface area (TBSA) affected by partial thickness or full thickness burns. First-degree burns that are only red in color and are not blistering are not included in this estimation. Most burns (70%) involve less than 10% of the TBSA. There are a number of methods to determine the TBSA, including the Wallace rule of nines, Lund and Browder chart, and estimations based on a person's palm size. The rule of nines is easy to remember but only accurate in people over 16 years of age. More accurate estimates can be made using Lund and Browder charts, which take into account the different proportions of body parts in adults and children. The size of a person's handprint (including the palm and fingers) is approximately 1% of their TBSA. To determine the need for referral to a specialized burn unit, the American Burn Association devised a classification system. Under this system, burns can be classified as major, moderate and minor. This is assessed based on a number of factors, including total body surface area affected, the involvement of specific anatomical zones, the age of the person, and associated injuries. Minor burns can typically be managed at home, moderate burns are often managed in hospital, and major burns are managed by a burn center. Disability-adjusted life years for fires per 100,000 inhabitants in 2004. ↑ ক খ গ ঘ ঙ চ ছ জ ঝ Tintinalli, Judith E. (2010). Emergency Medicine: A Comprehensive Study Guide (Emergency Medicine (Tintinalli)). New York: McGraw-Hill Companies. pp. 1374–1386. আইএসবিএন ০-০৭-১৪৮৪৮০-৯. ↑ ক খ গ ঘ ঙ চ Herndon D (ed.). "Chapter 10: Evaluation of the burn wound: management decisions". Total burn care (4th ed.). Edinburgh: Saunders. p. 127. আইএসবিএন ৯৭৮-১-৪৩৭৭-২৭৮৬-৯. ↑ Lloyd, EC; Rodgers, BC; Michener, M; Williams, MS (Jan 1, 2012). "Outpatient burns: prevention and care.". American family physician. 85 (1): 25–32. PMID 22230304.